・These price for 1 person. Please booking with 2 persons. This special price only offer for guest who using Darna transport car charter service. Above prices are 1 person fee, please booking over 2 persons. 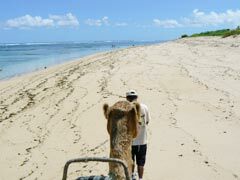 Walking with camel under the sun・・・along beautiful beach You should buy one camel t shirts for souvenir Instructor will take care of you. Payments at Camel Safari's counter in Nikko Bali. Paid transport area ： Not available for Ubud, Tabanan area. Please take own transport. 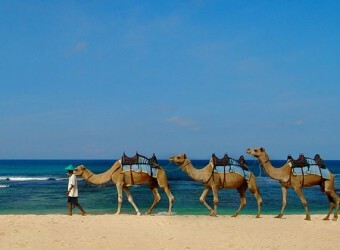 Due to sponcer regulation, Pregnant women, sick, handicaps or passenger outside the insurance cover age are not allowed to participate in the camel activity. Please understand. 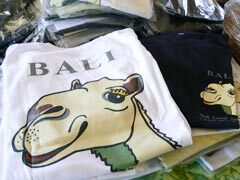 ・Camel safari original T-shirt can be purchased at the break point. 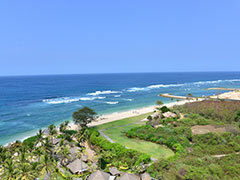 10 minutes from Jimbaran, 30 minutes from Kuta, Legian, 50 minutes from Sanur. 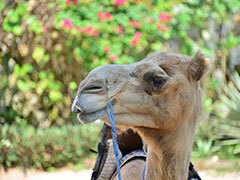 I think almost no opportunity to ride a camel in Japan. 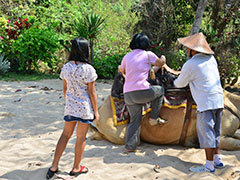 Camel is rare in Bali, I thought it was good to enjoy camel ride and took many pictures for memories. The camel almost didn’t move, very tame. I enjoyed the ride for an hour, but the sun light is hot I think 30 minute ride just good.